All IT4BI-DC candidates will follow a programme with the same structure, regardless of the academic institutions that provide the degree. This is ensured by a jointly designed IT4BI-DC doctoral process (see figure above). Each candidate will be involved on a research topic proposed by two institutions (i.e., home and host). The Doctorate thesis will be co-supervised by two professors, one from each of the proponent institutions using a co-tutelle model. All IT4BI-DC partners have extensive experience in doctorate co-tutelle arrangements. During the first two months after enrolment, the candidate together with his/her co-advisors will draft a Doctoral Project Plan (DPP), which formulates and concretises the elements involved in the research process. In addition, the DPP will specify the candidate's personalised education and training programme taking into account his/her previous background and future career prospects. It also specifies the expected mobility periods at the host university. With respect to mobility, candidates start the first year at their home university, spend (a part of) the second year at their host university, and return for the third year to their home university. Further, shorter stays at the host university are planned during the first and third years. Thus, Doctoral candidates will spend at least 33% of their doctorate at their host university, divided in three visits (two short visits will be at least 1 month, and a longer one at least 6 months). 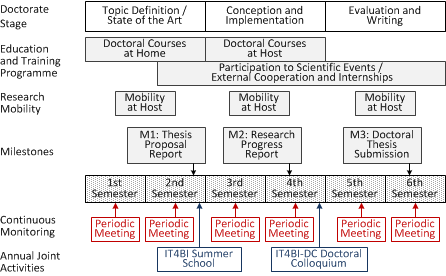 Three milestones are planned in the programme: M1, at the end of the first year, candidates present a Thesis Proposal Report (TPR, extension of the DPP); M2, at the end of the second year, candidates present a Research Progress Report, including a description of the main issues, early research results, and plan for the remaining work; and M3, at the end of the third year, candidates submit their Doctoral Thesis. Research-specific courses, providing doctoral candidates with focused state-of-the art technical skills pertaining to their research topic. Innovation and entrepreneurship courses, complementing the scientific training of candidates with business-related aspects such as entrepreneurship, intellectual property rights, etc. 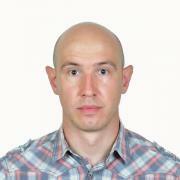 Methodological and communication courses, introducing the necessary research methods and communication skills. Language courses, introducing the local language at each partner HEI. Knowledge dissemination through mandatory conference presentations and journal publication, allowing candidates to present and confront their findings, thereby familiarising themselves with essential practices such as peer-review and public debating. External cooperation, ensuring that the candidate participate actively in another research environment outside his/her home and host universities. This is realised typically through internships at associated partners. Notice that the doctoral programme includes the participation to the European Business Intelligence Summer School (eBISS) organised by the Erasmus Mundus Master course IT4BI and the Doctoral Colloquium organised by IT4BI-DC.